After Sandra Young was diagnosed with late-onset Pompe disease at age 52, she thought her life would change and she would no longer be able to do the things she enjoyed. What Young discovered after her diagnosis is that independent living is as much a way of thinking as it is a way of accomplishing daily tasks. Independent living is a way of looking at disability and society with the understanding that individuals with disabilities deserve to fully participate in the world, no matter their physical limitations. The available services vary from one community to the next, but they might include assistance finding accessible housing and personal care attendants (PCAs), independent living skills training, peer counseling or legal aid. Each center is operated independently with funding from public and private sources, and currently, some are faced with reduced funding and higher demand for services. The MDA Resource Center (833-ASK-MDA1 or resourcecenter@mdausa.org) can help you find the independent living resources and services available to you, but the bottom line is that maintaining independence in your home takes initiative, problem-solving skills and the ability to network. Whether you dream of living in your first apartment or need extra help to stay in a home you own, the solutions for establishing a self-sufficient environment are unique to every individual. Here, experts and those like Young who are working every day to maintain their independence offer some advice. Independence begins as an idea, and parents play a key role in how their children envision the future. For many young adults, attending college may lead to living away from their family for the first time. In addition to the typical adjustments every freshman makes — dealing with homesickness, building a network of friends, managing their academic load — students with neuromuscular diseases must find accessible housing, navigate the college campus and sometimes secure caregiving support. Carol Lipari, who lives with facioscapulohumeral muscular dystrophy (FSHD) and uses a power wheelchair, moved hundreds of miles from her home in Illinois to attend the University of Arizona. “My mom always encouraged me to do what I wanted and find my own way,” she says. Living in a dorm and later an apartment meant that starting at age 18, Lipari was hiring and supervising her own PCAs. Today, Lipari lives in a high-rise apartment in Chicago and works as a resource coordinator for MDA. She has three PCAs who alternate coming to her apartment every morning and evening to assist her with bathing, meal prep and household chores. In her job as a social worker, Oberst sees a variety of ways people living with neuromuscular disease attain the help they need. Living on the West Coast, where housing prices are soaring and PCAs are in high demand, Oberst has clients who have switched from hiring a team of PCAs to a live-in caregiver. Providing a rent-free home for the caregiver is one way to substantially reduce the cost of full-time care. Not everyone needs a full-time caregiver, but many people with neuromuscular disease could use assistance with certain tasks. Oberst finds local senior centers often have a pool of volunteers. Churches and other religious institutions also might have volunteers willing to lend a hand. “Until you connect up with what’s in your community, you don’t know what you will find,” Oberst says. Identify your specific needs, like shoveling snow, running errands or cooking meals. Once you are armed with a list of needs, contact the directors of local organizations and ask for the help you need. “Take the initiative to sit down and meet. Sometimes little miracles work out,” Oberst says. Young, a New Jersey resident, has also explored the resources in her community that help with daily tasks. When doing laundry became too taxing, she signed up for a weekly service that picks it up and drops it off at her home. She orders groceries online from Walmart and picks them up at a nearby store without getting out of her car. Young enjoys baking, but weak shoulders make removing food from the oven difficult, so she calls her upstairs neighbor for assistance. Of course, she bakes him a pie to show her gratitude. Lindsey Baker, healthcare communications manager at MDA, was trained as a journalist, and the creativity she’s cultivated throughout her life helps her live independently with Charcot-Marie-Tooth disease (CMT). CMT has weakened her extremities, making it difficult to walk and use her hands. 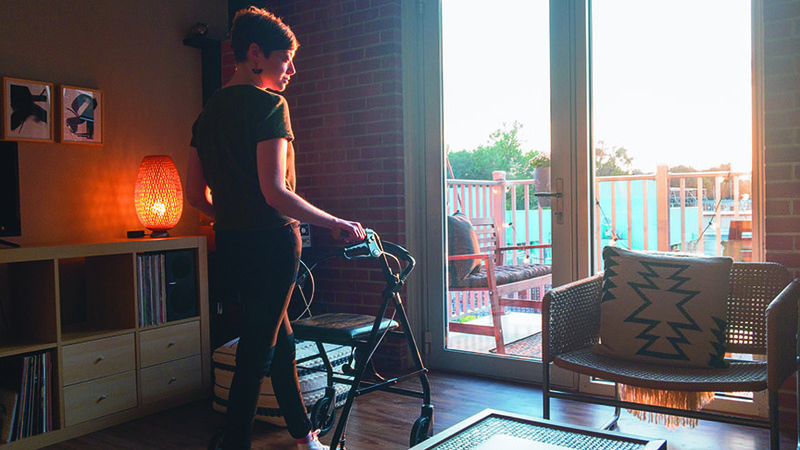 In the last 12 years, she has lived in six apartments, and with each move, she has had to adjust her living space to suit her needs and find workarounds for her changing abilities. Baker’s current apartment in Omaha, Neb., is not accessible, but it’s her favorite, with high ceilings and a sunny balcony. Before moving in, Baker visited the unit eight times, brainstorming on how to adapt the standard shower so it would work for her. After consulting with her father, a retired architect, and clearing her changes with the building management, she had a special shower bench designed and installed, along with a thin grab bar because her hand contractures don’t allow for a wide grip. A minimalist, Baker finds her compact apartment with its short walk between the bedroom and bathroom a good fit. She keeps her belongings neatly arranged and off the floor to avoid tripping. To control the lights and stereo, she purchased an Amazon Echo. In the kitchen, her workhorse appliance is a food processor/chopper/blender with only one big button to push. Two years ago, Baker stopped driving. Now, she hires someone to take her out for errands once a week. Her lack of a pincher grip makes picking things up difficult. When she drops a piece of paper on the floor, she uses the sticky side of a Post-it to pick it up. When you’re armed with initiative and problem-solving skills, you can build a network that helps you live independently in your home. For example, Young, who moved into an accessible first floor garden apartment when the stairs in her house became too difficult, works from home as national manager of foundations for MDA and is an expert at research. When she needed an adjustable bed, she began searching for assistance and found Patient Services, Inc. (patientservicesinc.org), an advocacy organization for certain chronic diseases, which provided funding for the bed. MDA Care Centers (mda.org/care/mda-care-centers) are also an important part of your network. Team members can help problem-solve for obtaining equipment and meeting other needs. Though she exudes confidence, Young acknowledges that remaining independent feels like a battle sometimes. Fortunately, it’s one you don’t have to fight alone. The maze of services designed to help people with disabilities live independently varies in every area. Typically, recipients of potential services or funding must fit specific criteria based on their age, disability, military service, county, income level and more. A good place to begin a search is with an Aging and Disability Resource Center (ADRC). These organizations — established in many communities across the country — are a gateway to a broad range of services for people at all income levels. An Area Agency on Aging (AAA) assists older adults who wish to remain in their homes. They might coordinate services such as housekeeping or meal delivery. Find your local ADRC and AAA by calling 800-677-1116 or visiting eldercare.gov. Keep in mind, “Aging and Disability Resource Center,” “Area Agency on Aging,” and “Center for Independent Living” are general terms. Each organization is operated independently, and the actual names of the organizations in your community may be different. A handy list of additional resources — covering a range of needs from assistive technology to housing — can be found at acl.gov/help. Barbara Twardowski has Charcot-Marie-Tooth disease (CMT) and uses a power wheelchair. Jim, her husband, is a registered nurse. The couple lives in Louisiana and writes about accessible travel, health and lifestyle.